Environmental Impact Assessment (EIA) is a planning and decision making tool first enshrined in the United States in the National Environmental Policy Act of 1969. The Government of India vide its policy and regulatory functions, ensures protection and improvement of the environment of India. Ministry of Environment, Forest and Climate Change, mandated to formulate policies, laws and rules related to environment, and issuing environmental clearance (EC) for any developmental project, as in the Schedule of the Environmental Impact Assessment (EIA) Notification, dated 14 September 2006, under the Environmental (Protection) Act, 1986. The EIA notification of 1994 was further improved upon with the more detailed notification of 2006. The EIA system, being multidimensional and interdisciplinary in nature, is concerned with identifying and evaluating direct and indirect impacts of a project on the environment. 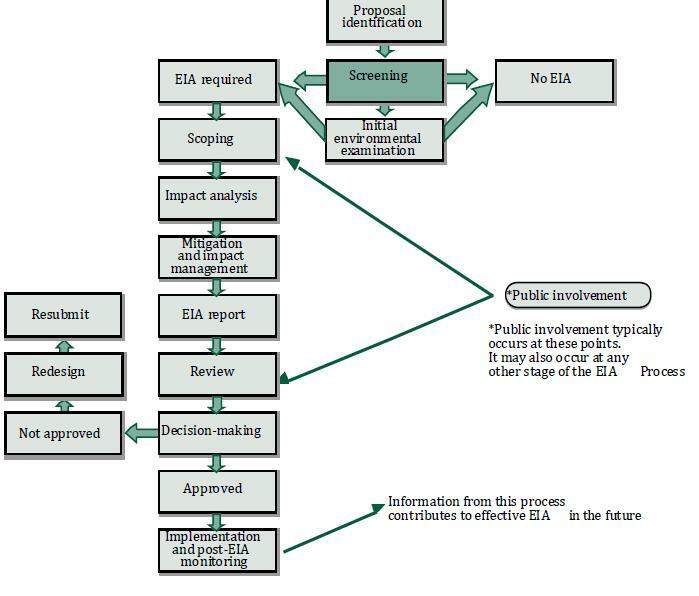 The EIA system supports project proponents in incorporating environmental considerations in project planning. (b) The environmental impact assessment is sound, and the proposed environmental mitigation measures are effective. 7. Environmental Impact Assessment: Formal document setting out the required information relating to the environment impact of the proposed development, including information gathered during the earlier part of the EIA process. EIA is an effort to anticipate measures and weigh the socioeconomic and biophysical changes that may result from a proposed building construction project. Best practice EIA identifies environmental risks, lessens conflicts by promoting community participation, minimizes adverse environmental effects, informs decision makers, and promotes environmentally sound projects. EIA of building construction projects focuses on the prediction of environmental impact of the different components of the construction activity, ways and means to reduce adverse impacts by shaping the project to suit local environmental conditions, and presents the predictions and options to the decision-makers. · To facilitate decision-making: For the decision-maker, for example the local authority, it provides a systematic examination of the environmental implications of a proposed action, and sometimes alternatives, before a decision is taken. The decision-maker along with other documentation relating to the planned activity can consider the environment impact statement (EIS). · To aid in the formation of development: Many developers see EIA as another set of hurdles for them to cross in order to proceed with their various activities. · To be an instrument for sustainable development: The key characteristics of sustainable development include maintaining the overall quality of life, maintaining continuing access to natural resources and avoiding lasting environmental damage. Institutional responses to sustainable development are, therefore, required at several levels which can be facilitated by EIA.